Here are more GTA 5 Online Tips and Tricks. In this article, we will cover up all of the following GTA 5 Online Tips and Tricks. 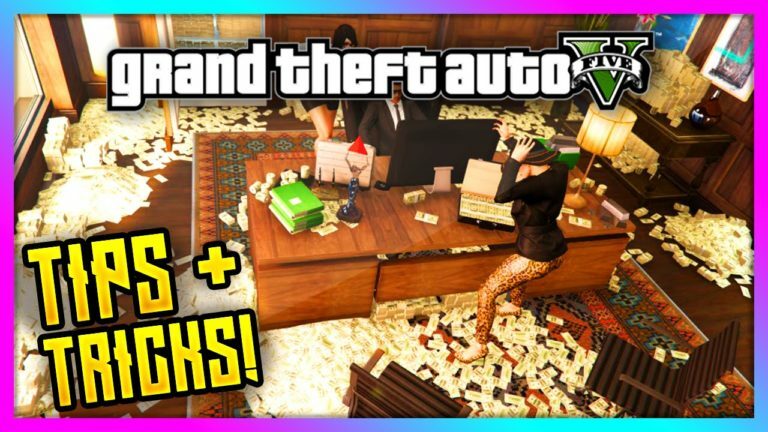 You unlock sticky bombs at level 19 in GTA 5 Online and here’s quick hint and when to buy them. If you wait until the pre-mission lobby they are only $400. If you purchase them otherwise at an Ammu-nation, they can cost you upto $600 (although this cost will decrease as you continue to level up). This is a pretty cool feature/piece of detail included by Rockstar in GTA V. Simply grab a fire truck and then aim the water cannon at a dirty car. Next thing you know that car will be showroom clean! Setup the race “Criminal Records” on a playlist either by yourself or with a friend and you can net about 6,000 RP each and every race. Given the race takes about 1 minute that means you should be rolling in RP. Just remember that when you do it solo you won’t earn any cash, just RP. Ever seen people running around in GTA Online with custom crew emblems and wondered how they got them? Well, it’s actually a glitch/workaround using the Social Club website. What you need to do is follow the tutorial at this link in order to create your own custom crew emblem for GTA Online. You’ll need a few different tools, but it’s totally worth it! When you die in GTA Online it will cost you 5% of your bank account funds up to a maximum of $5,000. The lesson – don’t die! Also when you die you will drop all your cash (obviously) plus another $100. You don’t even need to find an ATM to deposit money. Just go to the Maze Bank website on your cell phone (once you’re in a safe spot of course!). Don’t forget to deposit your money! This can be an easy thing to forget and is often a hard-learnt lesson! The best way to completely take out a Buzzard helicopter is to shoot the missile housing with a sniper rifle. One or sometimes two shots and it will explode. You can also try shooting the tail twice while it is flying and it should go down also. So if you see someone’s vehicle in GTA Online and they aren’t in it, here’s how you can blow it up and destroy it without getting a bad sport penalty. First shoot the car’s back tires and then cover the car using the gas from a jerry can (yeah, you’ll need one of those). Try to cover the rear tires the most but get the stuff everywhere. Then just wait. When the vehicle owner returns and goes to take off, the sparks from the popped tires should light the gas and the entire car should blow up. The funniest thing is that the driver/owner will be blamed! If you want to drop an item for someone (like a friend) or just get rid of it, then highlight it in your inventory or quick wheel and then press and hold Y (Xbox 360) or Triangle (PS3). If you know you’re gonna die a few times (whether it’s for mucking around, griefing someone, someone griefing you, etc) then here’s a way to ensure that you lose absolutely no money when you die, including hospital fees! First off put all your money into the bank and then change to your second GTA Online character. Withdraw all the money to them in cash and then switch back straight away to your first character. Your first character will have absolutely no money so you can die all the times you want without losing a dime. The best way to dodge air missiles is to actually fly towards them and then fly underneath them at the last minute. Missiles can turn upwards, left and right very quickly, but are not so good changing direction downwards. You may not know this, but if you steal a police vehicle you can actually save it into your garage in GTA Online. All you need to do is lose your Wanted Level and then save it and it can become a personal vehicle! What’s more, if you take it to a Pay and Spray then everything you can do there except chrome paint and getting bulletproof tires is free. Full insurance is also free. Pretty nice vehicle to have around, and you get a siren! I wouldn’t really call this a tip in that it’s not going to improve your driving abilities, but if you start drinking Pisswasser before a race in GTA Online then your character will get sloshed. Just make sure you hold down the action button when drinking and your character will finish off the bottle (and in fact this works with any consumable – hold down the button until it is full consumed!). You can get the Space Docker from the story mode in GTA Online, there are two requirements however. First you need your own garage and secondly you need to be playing with someone who has the Space Docker already. Oh, this glitch works for any vehicle too – not just the Space Docker. Get in the passenger seat of the Space Docker and call Gerald to request a job. Accept the mission and you will become the driver of the Space Docker. Now drive into your garage, park the Space Docker and leave on foot. Now fail the mission (like by blowing yourself up) and then enter freemode. Head back into your garage and the Space Docker will be there! This will enable you to duplicate a friend’s ride which you can then either sell or keep for yourself! First off you need to request a job from Gerald while you are in a friend’s car. Use your friends vehicles for the mission and be driving it when the mission ends. You should then go to free roam and still be in the vehicle. Head to Los Santos Customs. Try selling the car – if you can, sweet! If not, add a tracker to it and then come back later and try and sell it. Or you can add the tracker, insure it and keep the vehicle! A good way to earn RP (other than by completing jobs) in GTA Online is to get a high wanted level and then evade the police successfully. So to do this you can enter a convenience store and rob it (with a mask on of course), then get into a shoot out with the cops, then lose them, take off the mask (down one wanted level) and then continue to evade them until you lose your wanted level totally. Either you or your friend need to host a Criminal Records online race. You can find this under Jobs in a lobby. Make sure you setup the rules for the race as pictured further below. This is important. Then invite your friend in (or they invite you), choose any vehicle that you want and start the race. Note that you don’t really need to beat your friend, it might get you a few extra RP but it’s not really important. Just keep racing and you should be able to earn around 7,000 RP every 2 minutes. You are awarded the RP at the end of every lap. At the end of the race simply choose to replay it. Follow the pictorial shown at these two links and you’ll be able to complete Survial mode in GTA Online very easily. Do it right and you can earn $20K without too much effort or time. Violent Duct is a mission that you get from Gerald once you hit level 15. It pays out $9K and is relatively easy to do. Here’s some quick ideas to get it done with as little hassle as possible. So The Lost are doing a cocaine deal behind the Vanilla Unicorn and Gerald wants you to steal it. If you have at least one person with a decent gun it’s pretty easy. Someone goes straight in while another circles around behind The Lost by jumping over the fence on the right (there’s a cargo container you can use). Then you simply mow them all down. Once you get the coke one more van will show up. The person with the good gun can handle them, while the person who picked up the coke grabs a motorcycle and drives it towards the exit with the red/white bar. You can then finish the mission easily, restock and do it again! Hit down on the d-pad twice and your mini-map will expand. There are various places/locations/buildings in GTA Online that you can actually enter and go inside of and someone by the name of TerdSmash decided to create a handy list of them. Check out all the locations below along with hyperlinked map guide so you know exactly where to find it. Great for escaping the cops, your mates or that person trying to kill you! One way to escape a dog fight is to simply call Lester and pay the $500 to hide your radar signal for one minute. As soon as it’s activated head straight up in the sky and then once you’re high enough, take off from your attacker. A quick and sneaky way to get across the map quickly is to simply select a race that is nearby to where you wanna go. Go the the race, enter the lobby and then drop out of it. You should then spawn at the start of the race location in free roam. There is a way to fast travel in GTA Online and this is how you do it. Hover over a mission icon. It can be a race or anything. Press X on the Xbox 360 or Square on the PS3 to go to the mission. Straight after that back out. You should spawn right outside the area where the mission was. While riding your BMX tap R1 (PS3) or RB (Xbox 360) and hold forward slightly on the left analog stick. This should keep the front wheel on thhe ground and you should go a lot faster than you would otherwise. Just make sure that the very first car you ever steal in GTA Online is the very best you can find. This is because otherwise you’ll be forced to cruise around in whatever piece of crap you managed to get until you have enough cash for something new… and this might be a while. If you want to find out how much the bounty on a player is worth (like before you blow $3K worth of rockets on destroying him) simply call Lester and try to place a bounty yourself on the person. Lester will then tell you what the current bounty is. A series of minor adjustments can often be more helpful than large adjustments, particularly if you are hovering or trying to do a similarly precise task. Such minor adjustments are the only way to counteract turbulence. Holding the bumpers does not work. Do not worry about turbulence when you are flying quickly. Your helicopter will adjust itself as long as you continue to push the analog stick forward. If you are chasing a bounty then their auto aim will go directly to you (as pilot of the chopper). If you get killed then chances are the chopper will go down and everyone else will die. For this reason you should always be wearing body armor and make sure you’re covered at all times. If you are flying at a high speed in the helicopter, you can use this trick to stop quickly. Move the analog stick to either the left or the right and hold down the bumper that corresponds to that direction. This will make the helicopter spin, dip down, and then dip up. When it points up, release the analog stick and the bumper. You will have slowed considerably. Protect your helicopter’s tail rotor. It is one of the helicopter’s biggest weak spots. The Buzzard or Annihilator are the best choppers to use if you are bounty hunting in GTA Online. They can carry four people each and both are pretty maneuverable. The most basic thing to keep in mind for helicopter combat is that you must always be in motion, so that your enemies cannot hit you as easily. To go into a steep nosedive, push the analog stick forward and hold down LT (Xbox 360) / L2 (PS3). Be sure to leave yourself a few hundred feet to come out of the dive. When you are flying at a high speed, pushing the analog stick to the left or the right will send you into a roll, which will help you maintain your speed through turns. You can protect yourself by pulling down on the analog stick while holding down RT (Xbox 360) / R2 (PS3). Whoever is shooting at you will only be able to hit the armored helicopter, not your character. You can perform a similar technique to protect your side gunner by pulling the analog stick to the side opposite that of the gunner. If you want more maneuverability while flying a jet then lower the landing gear. This will slow you down and enable you to make quick, shorter turns. It also means that other players in the air trying to destroy will most likely be flying around you (make very large, high speed turns) this enables you get the jump on them.